Powers/Abilities: Terry is a genius, both a master inventor and a brilliant detective. Among his inventions were a miniature camera (used by Dr.Watson), and a variety of sensory devices. 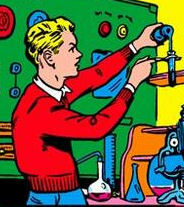 History: (Marvel Mystery Comics #10-57) Working from his attic laboratory, school boy Terry Vance invented a number of devices to help him solve crimes. 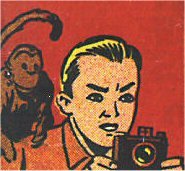 With his radio tuned into police frequencies, he would listen for intriguing cases, and when one arose, he would rush there, accompanied by his trusted companion, the highly intelligent monkey known as Dr.Watson.